The European directives are a clear expression of the willingness to make employees citizens in their places of work. The same intention is reflected in the EU Charter of fundamental rights (referred to in the Lisbon Treaty) which gives information and consultation rights the status of a basic right of European citizens. However, such fragmentation creates confusion and legal insecurity for both workers and their representatives as well as for management, compounded by the fact that most directives are poorly implemented. The rights pertaining to information and consultation of the workforce under Community law are currently some of the most fragmented in the EU legislative body. In total, more than 15 Directives deal with information and consultation in some kind of a general or specific sense. Currently, three major European Directives form part of the social acquis in this regard: (i) the Directive on European works councils (EWC); (ii) the Directive on employee involvement in the European Company (SE), and (iii) the European framework Directive on information and consultation. 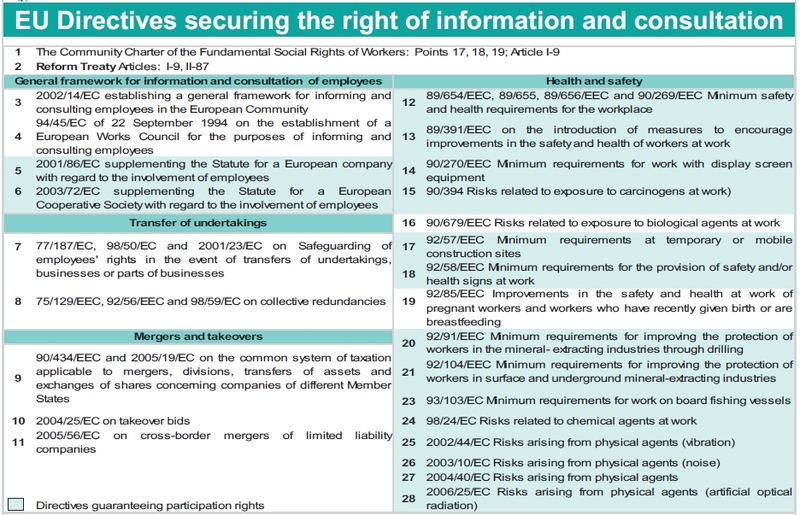 Besides this general frame, a range of Directives secure the right of information and consultation of workers in specific situations, such as in relation to health and safety at the work place, or in case of collective redundancies, transfer of undertaking, mergers, takeover, etc, as shown in Figure 1. The right to be informed and consulted is a workers' right that is recognised at international and European level. It is enshrined in the European Social Charter, the Charter of Fundamental Rights of the European Union and the Community Charter of the Fundamental Social Rights for Workers. The objective of Directive 2002/14 is to establish a general framework for informing and consulting employees in the European Community. In contrast to the EWC and SE Directives, this legislation lays down minimum standards at national level. It is the first in which the EU has extended to every member state the obligation to provide a procedure for effective, ongoing and regular information and consultation for workers on recent and probable developments in the undertaking’s activities, financial and economic situation, the evolution of employment and in particular of decisions that might lead to major changes in the organisation of labour. The two main objectives for the adoption of the Directive were to approximate Member States’ legislation concerning the practical arrangements and procedures for such redundancies and to afford greater protection to workers in the event of collective redundancies. In 1977 the Transfer of undertakings directive, 77/187/EEC, was adopted by the Council. According to the preamble, the differences in employee protection among the Member States can have a direct effect on the functioning of the Single Market. The purpose of the Directive is (Article 1) to protect employees’ rights in case of a ‘ transfer of an undertaking, business or part of a business to another employer as a result of a legal transfer or merger’. It aims to achieve partial harmonisation of the Member States’ legislation by extending the protection of workers to cover the case of transfer of undertakings. The aim of the Directive is to ensure, as far as possible, that the employment relation continues unchanged with the transferee and that the workers are not placed in a less favourable position solely as a result of the transfer. The objective of this directive is to guarantee payment of outstanding claims to employees in the event of their employer’s insolvency. The Directive applies to employees’ claims arising from contracts of employment or work relations and existing against employers who are in a state of insolvency within the meaning of the Directive. Member States may, by way of exception, exclude claims by certain categories of employee. Lessons have been learned about the manipulation of Community law together with the deliberate misconceptions of national law on worker information and consultation on the part of companies such as Renault.